After a stretch of warm and quiet days to start this week, the weather pattern looks to become active again over the next few days. SPC Severe outlook risk for Friday May 26 shows the potential for severe weather across Eastern Colorado. The Storm Prediction Center has issued a couple of general outlooks regarding our next storm system and mentions the front range of Colorado as a specific area to keep an eye on. 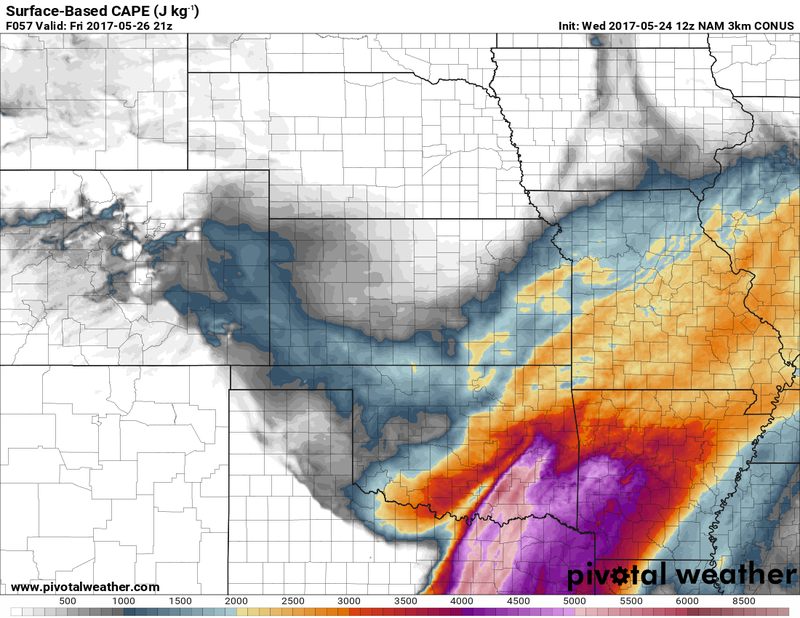 Deep-layer shear of 40-50 kts combined with weak/moderate surface-based buoyancy and very steep mid-level lapse rates will result in a favorable environment for supercells with potentially very large hail. 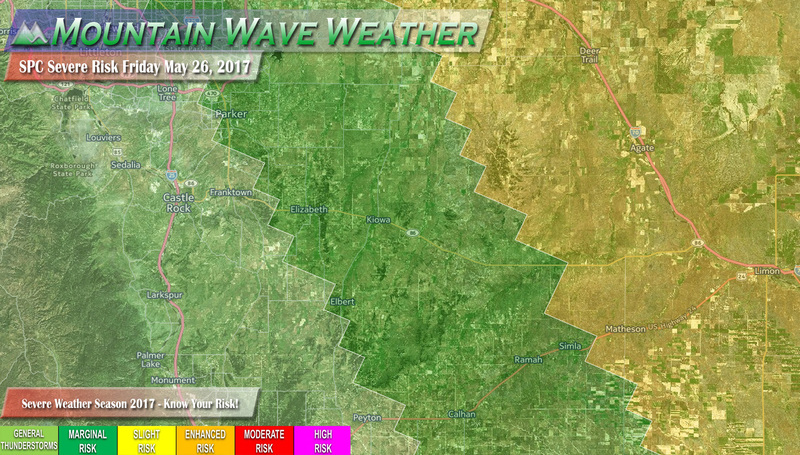 As you can see on the map above, the main area to keep an eye on is immediately east of Denver and the Eastern sections of the Palmer Divide. At this time, we only expect general pop-up thunderstorms along the I-25 corridor including Castle Rock. 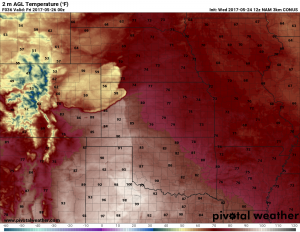 The point is that being a day 3 outlook (for Friday) this threat area can shift and should better moisture and heating move back along the front range, many areas around Denver could find themselves in the risk area. Wednesday will be quite pleasant around the area with mainly clear skies and temperatures in the upper 70’s to low 80’s. By Thursday a cold front and associated storm system will move through the area in the late afternoon or evening hours ushering in a chance for thunderstorms and strong winds. Nam 3K 6PM model shows cooler air moving in behind the front. 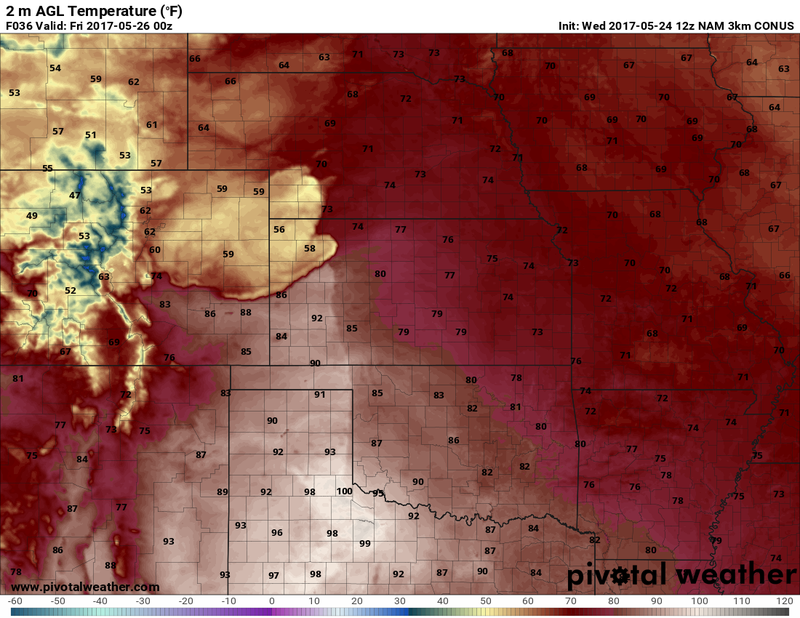 The cooler air aloft along with a surge of moisture will help form thunderstorms on Thursday but they will be mainly widespread with the latest models. Still, the SPC has the 2 day outlook with a chance of severe storms on Thursday but mainly areas to our East. Right off the bat, I’ll say that while there is a severe threat on Friday, it doesn’t look terribly widespread. So a lot of areas won’t see severe storms, but any area that has a storm form over it has a chance for that storm to grow severe. 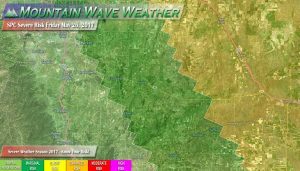 A slight risk generally means isolated severe thunderstorms. We know a decently powerful cold front moves through late Thursday (see image above) so we know the atmosphere will begin to destabilize. By Friday the cooler air has moved in, moisture has settled behind it and winds will most likely be Southeasterly by afternoon. This will help to from an upslope environment and promote instability. Instability is measured in a term called CAPE or Convective Available Potential Energy, the higher the number the more unstable the atmosphere. 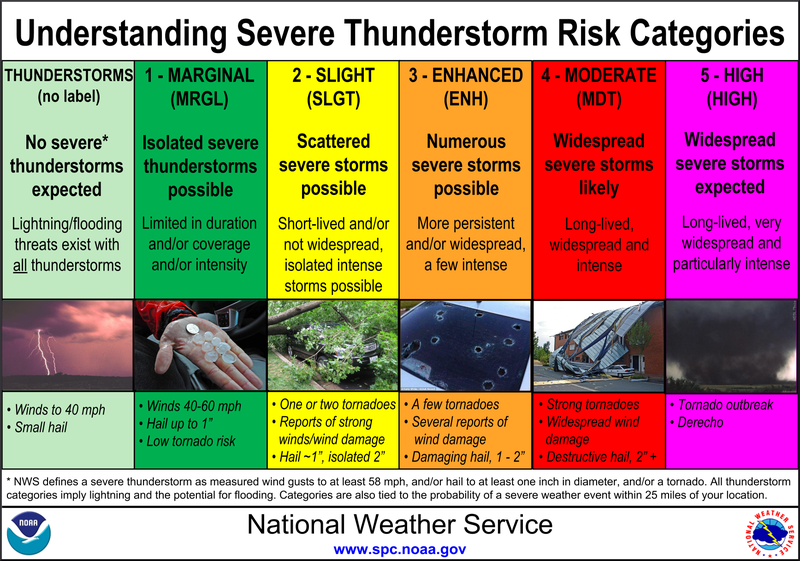 We can use this as a tool in forecasting areas of severe weather, but keep in mind… a higher CAPE environment doesn’t guarantee thunderstorms or even severe ones… other ingredients have to line up too! Another thing we can scope out on models is the height of the clouds bases (called LCL or Lifted Condensation Layer) This is the altitude where you can lift a parcel of air and it saturates or condenses and forms a cloud. It’s basically the fancy term of the bottom of the cloud. 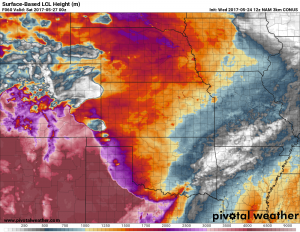 This is an important tool because it can help us see if storms form, what they do to the atmosphere (mix it out) and even give us a glimpse of how likely tornadoes are. Areas further West will need to keep an eye on the forecast over the next day or two, the threat area may shift depending on how the atmosphere sets up. Hail, damaging wind and rain are the primary threats at this time. We will keep an eye out to see if a tornado threat begins to develop. Keep an eye on the forecast from your favorite weather source over the next day or so. We will pass along any forecast and severe threat area changes. Keep the severe weather risk categories and what they mean in mind as we move into prime severe weather season in Colorado!